(CNN) -- Last year six people were killed by sharks worldwide. Multiply that number by more than 12 million and you get close to the number of sharks killed for human consumption each year. The annual mass slaughter of sharks, estimated to be around 73 million each year, has left one third of all shark species on the brink of extinction. "It's a grave situation that sharks are now faced with," say Matt Rand, director of the Pew Environment Group's Global Shark Conservation Campaign. "If serious action is not taken soon, the fate of shark species playing a viable role in the marine ecosystem -- one they've played for 400 million years -- is in jeopardy. Some say we've past the turning point; I hope that is not the case." On Monday a U.N. Food and Agriculture Organization summit began in Rome to discuss the problems facing global fish stocks. Some estimate that around 70% of fishing areas are fished out or fully exploited. A recent report from the Pew Environment Group and TRAFFIC suggests sharks fishing, particularly the practices of finning, needs to be at the top of the agenda as regulations on shark catching have failed to stop an alarming decline in their numbers. 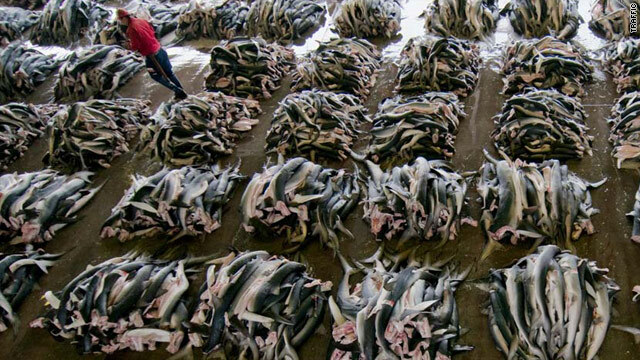 Shark fins are increasingly sought after in Asia, particularly China, as they are used in soups and other products. Finning -- where a shark's fins are removed and the body dumped -- is outlawed by the U.S. and EU, but loopholes and lack of regulation and enforcement elsewhere have meant it remains a major problem. An international action plan for sharks has been in place for ten years, but it leaves the responsibility of sustainably managing and recording catches to each country. While a few had made "excellent progress," the majority of countries had not, according to the U.N.'s Food and Agriculture Organization (FAO) in 2005. "It's a good plan; it's very well thought out," says Rand. "If it was implemented we'd be seeing healthy populations. Unfortunately that's not the case." Of the top four shark catchers -- Indonesia, India, Spain and Taiwan -- only Spain provides a breakdown on what species it is catching. Rand hopes that the summit in Rome will provide some time for the FAO to reflect on the global dynamics of sharks, and that they will "recommit to take this international plan of action seriously and implement it." "We're pointing out to the shark catchers that they can make the change. We hope it's not just the NGOs just looking at what's happening. Now is the opportunity to recommit to the international plan to save sharks," he says. Away from international regulations there are some bright spots in shark conservation efforts. Palau, Honduras and the Maldives have all declared that no sharks can be caught in their waters. "They realize that it's very hard to have a sustainable fishery of a species that doesn't reach sexual maturity until in its teens and then only produces a few pups every time they give birth," says Rand. Shark tourism is also being increasingly valued by coastal communities across the world. Scott Henderson of Conservation International has lived in the Galapagos Islands for 20 years and witnessed the rise in diving tours in the area, the main attraction being the chance of seeing sharks. But even the world's most protected marine eco-system has not been immune to shark catching. Illegal shark fishing around the Galapagos does occur, says Henderson, although he believes it is under control and becoming less frequent. "There is nothing inherently wrong with fishing, and cultural traditions must be respected. However, as the elephant ivory trade, mountain gorilla exterminations and rhinoceros horn trade tragedies all prove, both suppliers and markets need to be responsible in curbing their activities when extinctions are imminent." Rand describes the uncontrolled catching of sharks as a "massive experiment on the world's oceans." "There's a big question mark as to how far they will decline," he says. The impact of declining shark numbers on marine eco-systems and the knock-on effect on fishing industries has already been felt in regions around the world. The rapid decline of black tip sharks in the west Atlantic Ocean since the early 1990s led to a rise in cow-nosed rays and decline in the North Carolina bay scallop industry. "Whether you care about sharks, themselves, or the oceans they regulate, it's in everyone's interest to curb the massive overfishing of sharks that is putting oceans at risk," says Henderson.